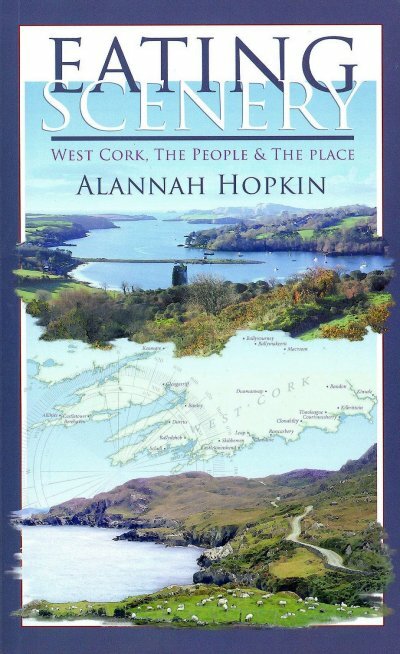 Just launched last week Alannah Hopkin’s exploration of West Cork is a lovely read that draws the reader into a wonderfully complex view of the area. Originally from London, Alannah returned to her mother’s home in Kinsale. Whilst the pub was Pete McCarthy’s primary access point to discover West Cork in McCarthy’s Bar, Alannah’s is much more about the kitchen table. She spends time with people from all walks of life, visiting their homes, listening and reflecting on her own attraction to West Cork. This book is very much about people and of necessity it’s selective, all the more interesting and personal for that. To enhance the personal perspectives Alannah has meticulously researched and recorded details and dates. She moves effortlessly from people’s stories, through factual and historic analysis to her own learnings on the way meeting farmers and food producers like Norman Steele of Milleens Cheese or Pat McCarthy from Dunmanway who reflects on the changes from the joining the EEC to the recent decoupling and REPS. She meets environmental activists like Ian Wright from the INFF and Thomas Reidmuller at the Hollies, tours the islands, visits craftworkers at Coolmountain, has tea in some of the big houses and talks to Jeremy Irons and others who have taken on restoration projects. She sets aside separate chapters to visit Beara and the Gaeltacht. Everywhere she finds people open and engaging, each with a very different story to tell and a lot of knowledge about living. This is the first full-length book to tackle all aspects of West Cork, it has reminded me of why I like living here, taught me a lot I didn’t know, it has encouraged me to spend more time exploring new parts of West Cork and listening to people.